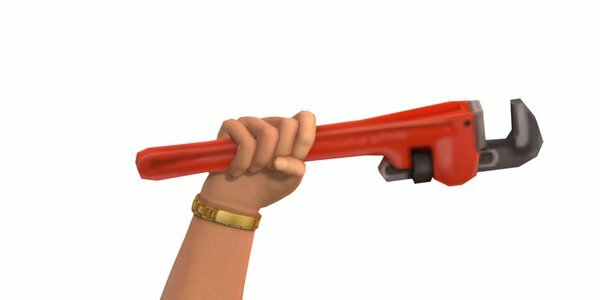 The Sims 4: Repairman Teaser For November Update? 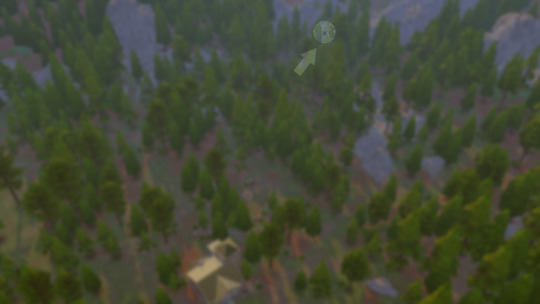 According to The Sims Twitter, here a teaser about repairman! "Broken fridge? Again? Yep. I can swing over on Tuesday. Alright, see you then." The Sims 4: 50% Discount and Free Upgrade To Digital Deluxe! Hi simmers! 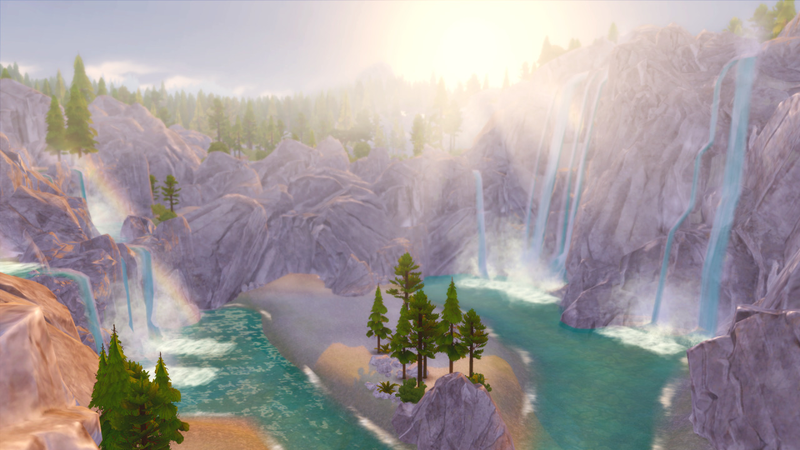 Maybe it’s too late :( But maybe you’re don’t know about this Secret Place on Granite Falls ( Outdoor Retreat Game Pack ). Go vacation by clicking on the phone and click go vacation. Looking forward to sharing more with you in November! Jika kamu memperbarui The Sims FreePlay ke versi 5.17.0 maka kamu akan menyadari adanya fitur baru, yaitu VIP Points. Kami tahu banyak diantara kalian yang masih bertanya-tanya, apa itu VIP Points dan VIP Perks karena penerbit FreePlay (Electronic Arts) dan pengembangnya (Firemonkeys) sebelumnya tidak pernah memberi demo atau informasi mengenai ini. Untuk itu kami akan mereview, apa itu VIP Perks dan VIP Points. VIP Points, adalah point yang dibutuhkan untuk mencapai VIP Perks tertentu. 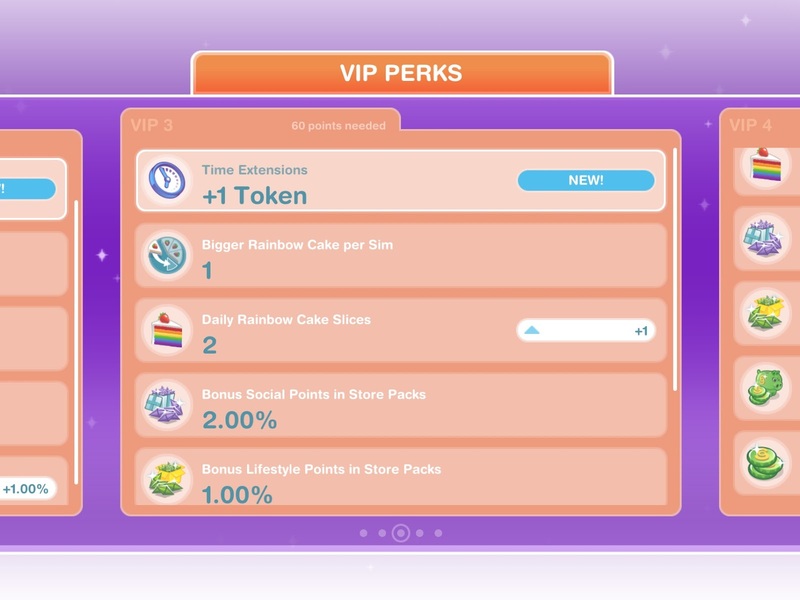 VIP Points akan kalian peroleh ketika kalian membeli in-app purchase FreePlay apapun. Jumlah point yang didapat variatif. Ada point-point yang harus kalian capai untuk mentapat VIP Perks. Ada 5 jenis VIP Perks, masing-masing perks mempunyai keunggulan masing-masing. Jika kalian membeli Social Points dari online store, maka kalian dengan status VIP 1 akan mendapatkan sosial point tambahan sebanyak 2%. Dengan token ini, kamu dapat memperpanjang waktu Quest. Pemain dengan status VIP 4 akan mendapatkan pakaian eksklusif. Jika kalian membeli Social Points dari online store, maka kalian dengan status VIP 1 akan mendapatkan sosial point tambahan sebanyak 4%. Seperti yang kita tahu, kita hanya dapat membuat atau 4 Sim dalam satu rumah (atau satu keluarga). Pemain dengan status VIP 5 akan dapat membuat 5 Sim dalam satu rumah. 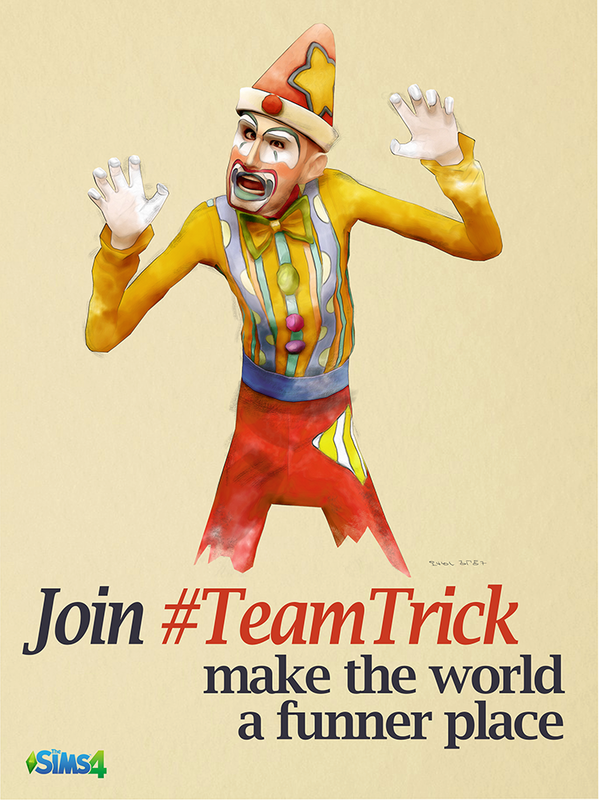 Apa itu #TeamTrick vs. #TeamTreat Challenge? There are 5 phases/rewards in this quest. First reward is Fawn and Reanimated costume. Second reward is Astronauts costume for toddlers. Third reward is Unicorn and Lion costume. Fourth reward is Fairi and Pumpkin costume and you will unlock the limited-time reward: Halloween custome set if you complete this quest in time. 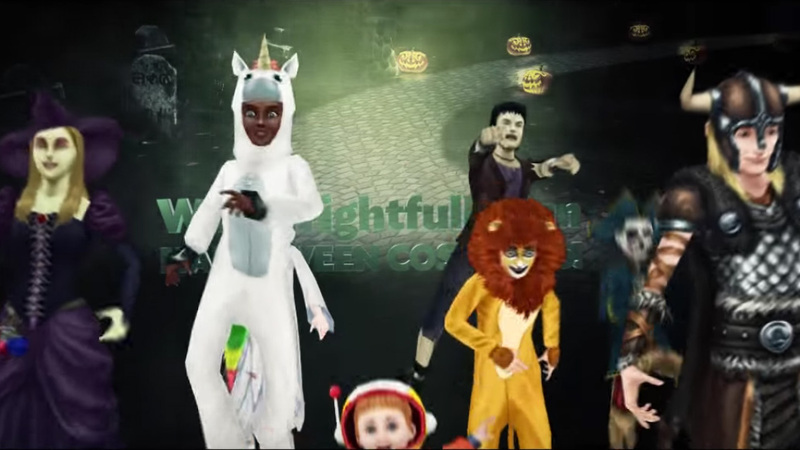 Halloween costume set include witch costume, ghost, pirate, zombie and more. You have 10 days to complete this quest. Tap computer and select "Browse for Costume" - 48 secs (3-star computer). Tap telephone and select "Call Costume Store" - 4 mins (3-star telephone). Send a Sim to the park. There is purple monster appear in park, tap it and select "Approach" - 2 secs. Tap the park bench and select "Hide" - 2 hrs 20 mins. Tap the white ghost and choose "Talk to" - 5 mins. Tap TV and select "Watch Halloween News" - 19 hrs (3-star TV). Misty follows you to your home. Tap her and select "Talk to" - 25 mins. Select an adult Sims, Tap another adult Sim and select "Practice Scaring" - 8 secs. Tap a couch and select "Build Courage" - 5 hrs (3-star couch). Okay, you need to collect candy. Purple Monster will appear in lot your Sim stay in. Tap it and tap "Collect Candy" to get candies. Click How to Collect Candy Faster for tpis - 5 hrs every action. Tap another Sim and select "Form a Party Plan" - 5 mins. Tap computer and choose "Halloween Invitation" - 12 mins (3-star computer). Tap Misty (white ghost) and select "Ask for Advice" - 7 hrs 30 mins. Tap another Sim and select "Practice Scaring" - 8 secs. Tap Misty and tap "Show Off Skill" - 8 hrs 30 mins. The Orange Candy appear in the lot your Sim stay in. Tap it and select "Scare" - 8 secs. Tap a couch and select "Pout" - 10 hrs (3-star couch). Tap Misty and tap "Ask what Happened" - 25 mins. Tap Purple Monster and select "Collect Candy". You need to collect 30 pieces of candy. Click How to Collect Candy Faster for tpis - 4 hrs 30 mins every action. SAMPAI TAHAP INI KAMU AKAN MENDAPATKAN KOSTUM ASTRONOT UNTUK SIM BALITA KAMU. You have to wait until a certain time for the next task. Or you can skip it for next tasks. It cost 5 LP. Tap computer abd choose "Tell About Costumes" - 4 mins (3-star computer). Tap couch and choose "Think of a Solution" - 8 hrs (3-star couch). Select an adult Sim, then tap the selected Sim and tap "Funny Selfies" - 1 hrs 30 mins. Tap komputer ans select "Email Selfies" - 16 mins (3-star computer). Tap another Sim and choose "Joke" - 5 mins. Tap a bed and choose "Have Nightmares" - 9 jam (3-star bed). 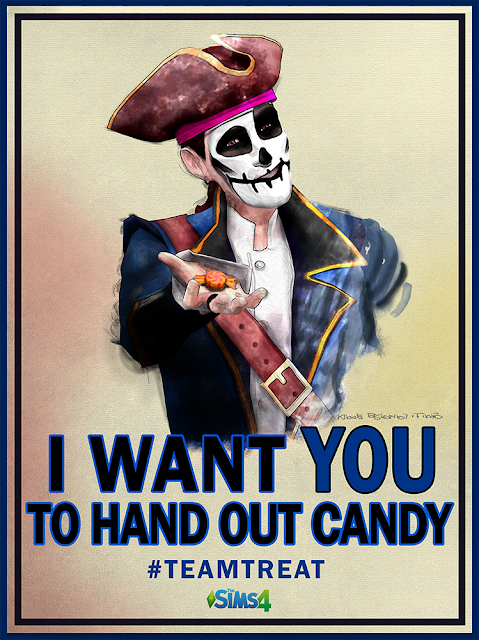 Okay, this time you need yo collect 100 pieces of candy. Tap purple monster and select 'Collect Candy'. Click How to Collect Candy Faster for tpis for tpis - 3 hrs 30 mins every action. YOU NOW UNLOCK UNICORN AND LION COSTUME. Tap another Sim and select "Halloween Party Needs" - 5 mins. Tap referigerator and choose "Check Food Supplies" - 8 mins (3-star referigerator). Go to the park, Tap the grill, and choose "Roasted Pumpkin" - 10 hrs 15 mins. Buy a stereo from the home store in the Electronic section. Tap stereo and select "Turn On" - Instant. Tp stereo and select "Spooky Music" - 2 hrs (3-star stereo). Tap Misty and select "Ask what to do" - 12 hrs 30 mins. This time you need to collect 175 candies. Click How to Collect Candy Faster for tpis for tpis - 2 hrs 30 mins every action. YOU NOW UNLOCK FAIRY AND PUMPKIN COSTUME. Tap Misty and select "Show Improved Skills" - 5 mins. Send a Sim to the Park using Sim Tracker. There is orange moster in the park. Tap in and select "Scare" - 8 secs. Tap the park bench and choose "Hide" - 2 hrs. Tap Misty and select "Talk to" - 9 hrs 30 mins. Go home, There is "X" sign in front of your Sim's house. tap it and select "Place Candy" - 2 hrs 30 mins. Send a Sims to the park again. Tap the Orange Monster and select "Distract" - 2 hrs 30 mins. Tap the "X" sign, tap "Place Candy" - 1 hour 25 mins. Tap the Orange Monster and select "Scare" - 2 secs. Tap Orange Monster and select "Hug" - 6 secs. Go Home. Call another Sim to the house, gather 4 Sims in a house. Kami tahu betapa frustasinya mengumpulkan permen di quest Night of the Candy Moster. Pertama kita harus mengumpulkan 5 permen, kedua 30 permen, ketiga 100 permen, dan terakhir 175 permen. Makin lama, makin banyak permen yang diminta. Kami punya tips bagaimana cara mengumpukan permen lebih cepat. Karena monster ungu sekali muncul jumlahnya ada 5, maka kalian bisa menggunakan 5 Sim untuk memperoleh permen darinya. Menggunakan 5 Sim akan menghemat waktu kamu daripada satu Sim. Monster ungu akan muncul beberapa menit setelah kalian selesai selesai mengumpulkan permen. Kerjakan hal lain sampai dia muncul kembali di lot Sim kamu sedang tinggal. We know how how frustrated you collect candy pieces in Night of the Candy Monster quest. First we need to collect 5 candy pieces, second is 30, third is 100, and fourth is 175 pieces. We have some tips how to collect candy faster. 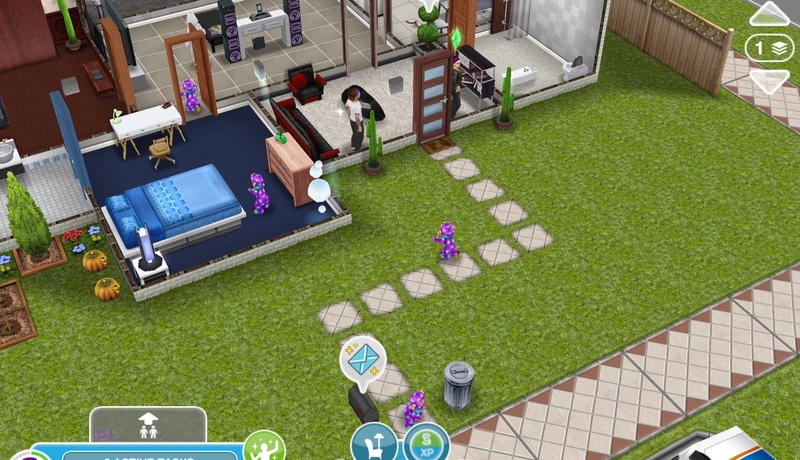 Because we have 5 Purple Monsters in game, we can use Sims up to 5 Sims to collect candy from the Purple Monsters. 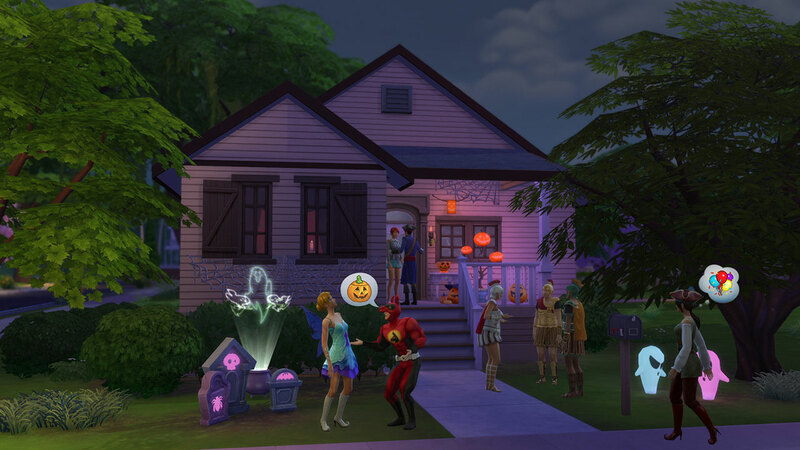 Gather and use 5 Sims to collect candy. It's way faster than you use only 1 Sim. The Purple Monsters will appear in lot every minutes after you finish collect the candy pieces. 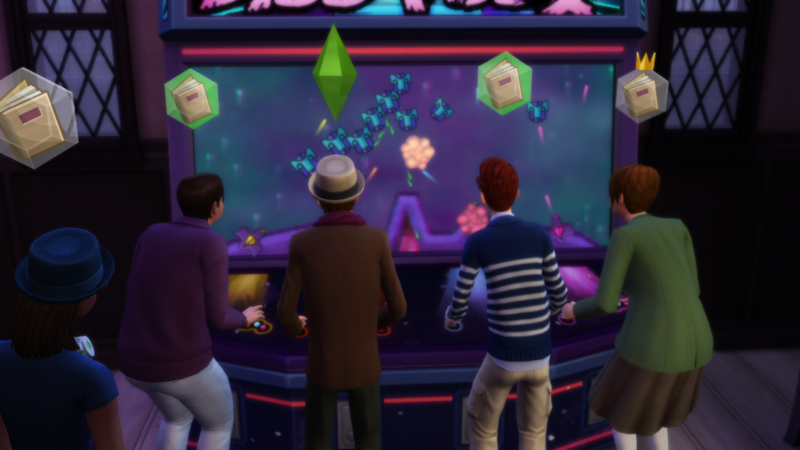 You can do whatever you want with your Sims while you're waiting for the Purple Monsters. 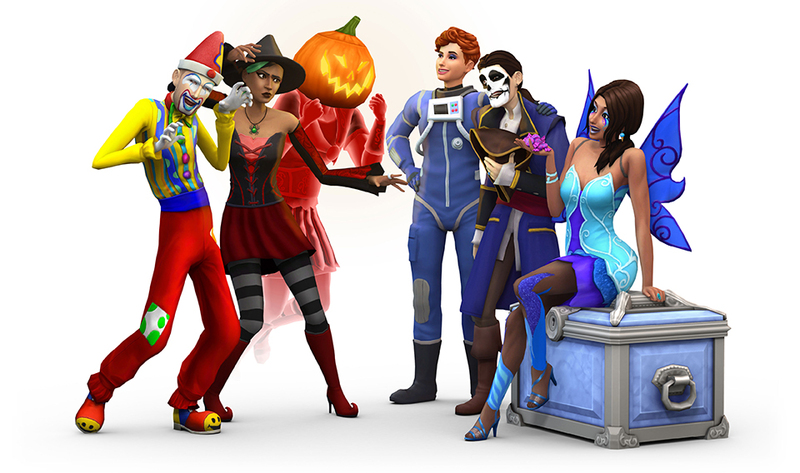 The Sims 4 News: #TeamTrick vs. #TeamTreat Challenge! Pirates or ninjas? Half-full or half-empty? That sparkly vampire guy or that shirtless werewolf guy? For eons, these arguments have echoed in the halls of academia and internet forums, with millions choosing a position and arguing it vehemently. But there’s one debate so polarizing it eclipses all others… trick or treat? And soon, you’ll be asked to choose a side in this timeless debate. The #TeamTrick vs. #TeamTreat Challenge kicks off in The Sims 4 on October 23 and runs through October 31! It’s not all fun and games, though – there are items on the line! You’ll be working on unlocking new decorated doors, fantastic fish, and awesome storage chests! If you choose to participate, you’ll play a role in which items get unlocked – will it be the creepy #TeamTrick items, or the playful #TeamTreat versions? That’s up to The Sims 4 community. Two new interactions (Trick and Treat) are temporarily available in The Sims 4 for all players, and you’ll need to choose between them to help unlock different items in the game. 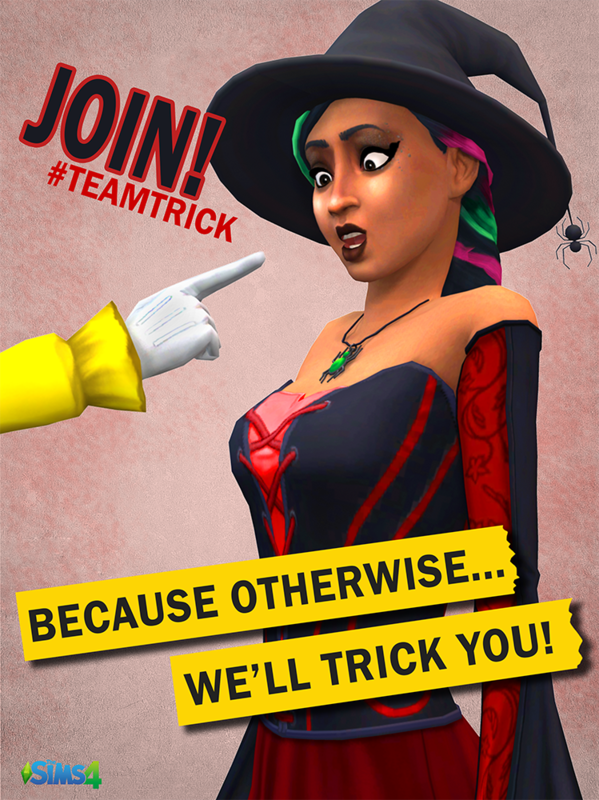 If you’re on #TeamTrick, you’re going to want to task your Sim with tricking everyone in sight, while Sims on #TeamTreat will be handing out sweet treats to the Sims they meet. 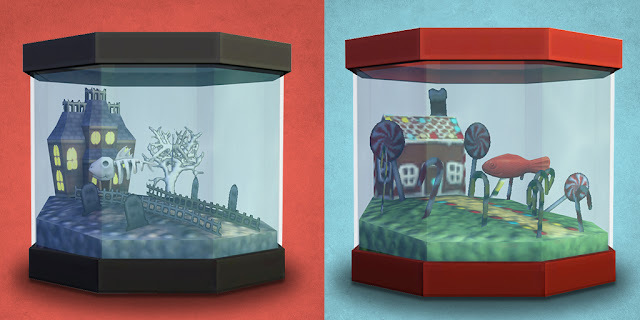 There are #TeamTrick and #TeamTreat versions of each item: #TeamTrick has a demonic door, a skeletal fish in a spooky bowl, and an interactive chest; and #TeamTreat has a lion door, a candy fish in a delicious bowl, and a usable chest of its own. 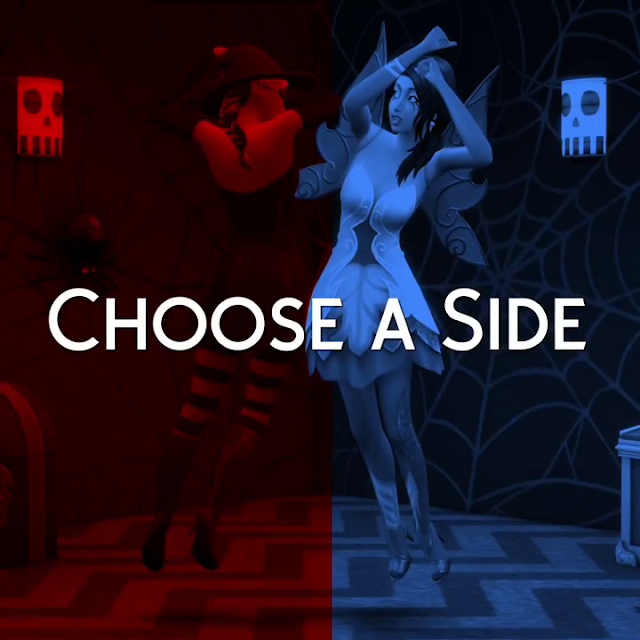 Whichever side wins (that is to say, if there are more Trick interactions or Treat interactions) will end up getting their version added to the game in early November. Everyone gets the items – your actions are choosing which items are actually added! Want the sweet Candy Fish? You’d better hope #TeamTreat wins during that period, otherwise everyone will be hanging out with the Skeleton Fish instead. 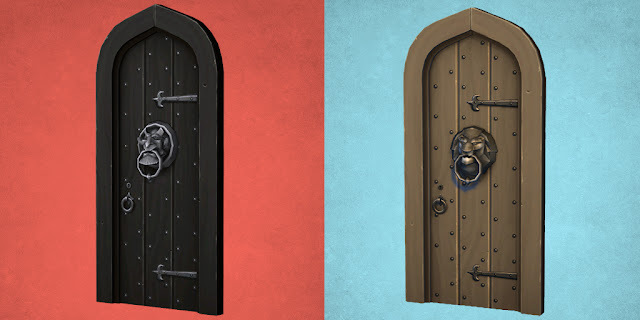 The cool Demonic Door? That’s a #TeamTrick item, so you’ll need to trick for that one. 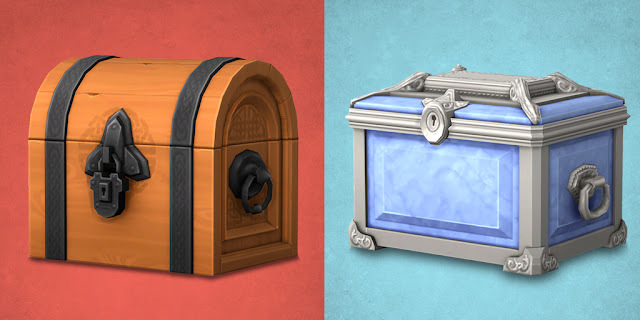 The chests are assigned to the different sides, too. Which side will you choose? 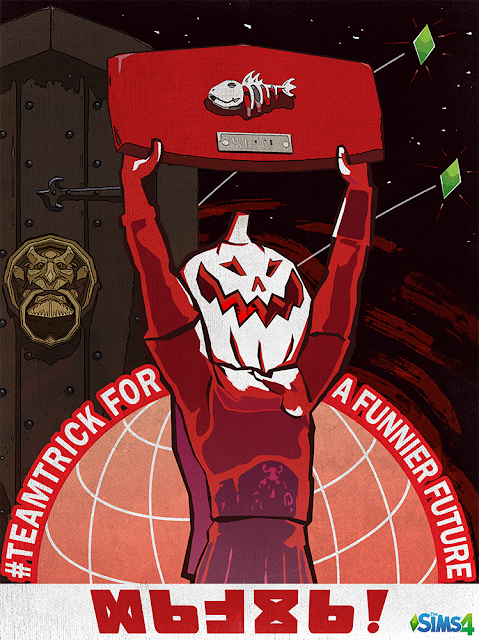 Head onto Twitter, Instagram, Facebook, and Tumblr using #TeamTrick and #TeamTreat to show your allegiance, and spread the word if you want to unlock the items associated with your side. The full details are below, and we’ll keep this article updated as the results come out. Ada beberapa tahapan/reward di quest ini. Reward pertama, untuk mendapatkan seset kostum Fawn dan Reanimated and imposing. Kedua untuk mendapatkan kostum astronot untuk Sim balita. Selanjutnya saat ini belum diketahui rewardnya. Dan hadiah dengan waktu terbatas adalah kostum halloween lengkap, di dalamnya ada kostum penyihir, hantu, bajak laut, zombie dan masih banyak lagi. Kamu harus menyelesaikan quest ini tepat waktu untukk mendapatkannya. Kamu diberi waktu 10 hari untuk menyelesaikan misi ini untuk mendapatkan kostum halloween lengkap. Tap komputer dan pilih "Browse for Costume" - 48 detik (komputer bintang 3). Tap telepon, lalu pilih "Call Costume Store" - 4 menit (telepon bintang 3). Tap monster kecil warna ungu yang ada di taman, pilih "Approach" - 2 detik. Tap bangku yang ada di taman lalu pilih "Hide" - 2 jam 20 menit. Tap wanita yang berpakaian warna putih lalu pilih "Talk to" - 5 menit. Tap TV dan pilih "Watch Halloween News" - 19 jam (TV bintang 3). Misty akan mengikuti kamu ke rumah. Cari dia di sekitar rumah Sim kamu, tap dan pilih "Talk to" - 25 menit. Pilih Sim dewasa, tap Sim dewasa lainnya dan pilih "Practice Scaring" - 8 detik. Tap sofa dan pilih "Build Courage" - 5 jam (sofa bintang 3). Oke, sekarang kamu ditugaskan untuk mengumpulkan permen. Purple Monster ada di rumah Sim kamu. Tap dan pilih "Collect Candy" untuk mendapatkan permen. Satu Purple Moster saja tidak cukup, kamu harus mengumpulkan 5 permen. Cari Purple Monster di kota. Kunjungi tempat-tempat umum seperti taman bermain (amusement park), swimming pool, community center, dll untuk mencarinya. Saya menemukan mereka di amusement park - 5 jam tiap action. SAMPAI TAHAP INI KAMU AKAN MENDAPATKAN KOSTUM FAWN & REANIMATED. Setelah ini, kamu disuruh menunggu beberapa jam untuk quest selanjutnya atau kalian bisa skip menggunakan LP. Tap Sim lain dan pilih "Form a Party Plan" - 5 menit. Tap komputer lalu pilih "Halloween Invitation" - 12 menit (komputer bintang 3). Tanya Misty (hantu baju putih) dan pilih "Ask for Advice" - 7 jam 30 menit. Tap Sim lain dan pilih "Practice Scaring" - 8 detik. Tap Misty dan pilih "Show Off Skill" - 8 jam 30 menit. Orange Candy Moster kini muncul di rumah Sim kamu. Tap dia dan pilih "Scare" - 8 detik. Tap sofa dan pilih "Pout" - 10 jam (sofa bintang 3). Tap Misty dan pilih "Ask what Happened" - 25 menit. Tap monster ungu dan pilih "Collect Candy". Kumpulkan hingga 30 permen. Cari monster ungu di tempat umum untuk mendapatkan permen - 4 jam 30 menit tiap action-nya. Kamu akan disuruh menunggu sampai waktu tertentu untuk memulai tugas-tugas berikutnya. Atau kamu bisa skip menggunakan LP untuk langsung ke task berikutnya. Tap komputer dan pilih "Tell About Costumes" - 4 menit (komputer bintang 3). Tap sofa dan pilih "Think of a Solution" - 8 jam (sofa bintang 3). Pilih Sim dewasa, lalu tap pada Sim yang terpilih dan pilih "Funny Selfies" - 1 jam 30 menit. Tap komputer dan pilih "Email Selfies" - 16 menit (komputer bintang 3). Tap Sim lain dan pilih "Joke" - 5 menit. Tap kasur dan pilih "Have Nightmares" - 9 jam (ranjang bintang 3). Oke, kali ini kalian harus mengumpulkan 100 permen. Caranya seperti pada task sebelumnya - 3 jam 30 menit tiap action-nya. SAMPAI TAHAP INI KALIAN AKAN MENDAPATKAN KOSTUM UNICORN DAN LION. Kalian akan disuruh menunggu sampai waktu tertentu. Atau kalian bisa skip menggunakan LP dan langsung ke task berikutnya. Tap Sim lain dan pilih "Halloween Party Needs" - 5 menit. Tap kulkas dan pilih "Check Food Supplies" - 8 menit (kulkas bintang 3). Pergi ke taman, tap pemanggang, dan pilih "Roasted Pumpkin" - 10 jam 15 menit. Beli stereo dari Home Store bagian Electronics. Tap stereo dan pilih "Torn On" - Instan. Tap Stereo dan pilih "Spooky Music" - 2 jam (stereo bintang 3). Tap Misty dan pilih "Ask what to do" - 12 jam 30 menit. Kali ini kamu harus mengumpulkan 175 permen dari monster ungu. - 2 jam 30 menit untuk setiap actionnya. SAMPAI TAHAP INI KAMU AKAN MENDAPATKAN KOSTUM FAIRY DAN PUMPKIN. Kamu akan di suruh menunggu sampai waktu tertentu atau kamu bisa skip dengan 5 LP untuk mendapatkan task berikutnya. Tap Misty dan pilih "Show Improved Skills" - 5 menit. Tap monster orange yang ada di taman dan pilih "Scare" - 8 detik. Tap bangku yang ada di taman dan pilih "Hide" - 2 jam. Tap Misty dan pilih "Talk to" - 9 jam 30 menit. Pulang ke rumah, di depan ruma Sim kamu akan ada tanda X, tap itu dan pilih "Place Candy" - 2 jam 30 menit. Tap Orange Moster yang ada di taman dan pilih "Distract" - 2 jam 30 menit. Tap tanda X yang ada di taman, pilih "Place Candy" - 1 jam 25 menit. Tap monster orange dan pilih "Scare" - 2 detik. Tap mosnter orange dan pilih "Hug" - 6 detik. Pulanglah. dan panggil Sim lain ke rumah (hingga 4 sim dalam satu rumah). The Sims 4: Are We Getting Toddlers? 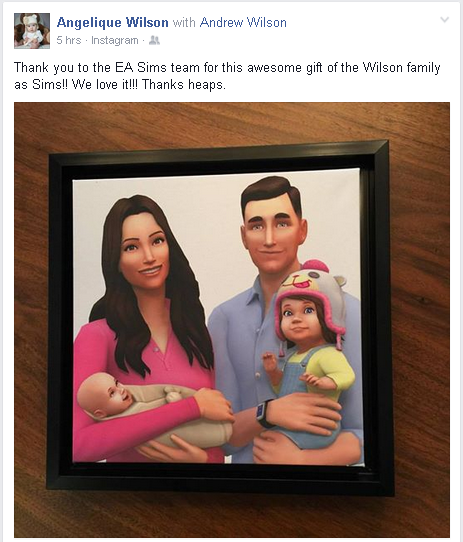 Meskipun ini hanya sebuah art atau sketches atau render yang diperuntukan kepada Angelique Wilson (Istri dari pemilik Electronic Arts) setidaknya kita akan tau bagaimana rupa toddlers dimasa yang akan datang! and it's super cute! Setelah memperbarui The Sims FreePlay ke versi 5.17.0, kini pengguna Android dapat menambahkan akun Googlenya. Fungsinya sama dengan akun facebook, yaitu mengambil daftar teman jika sudah berteman di Google Play Games atau akun Google+nya, juga akun tersebut digunakan untuk akun penyimpanan save game ke The Cloud. 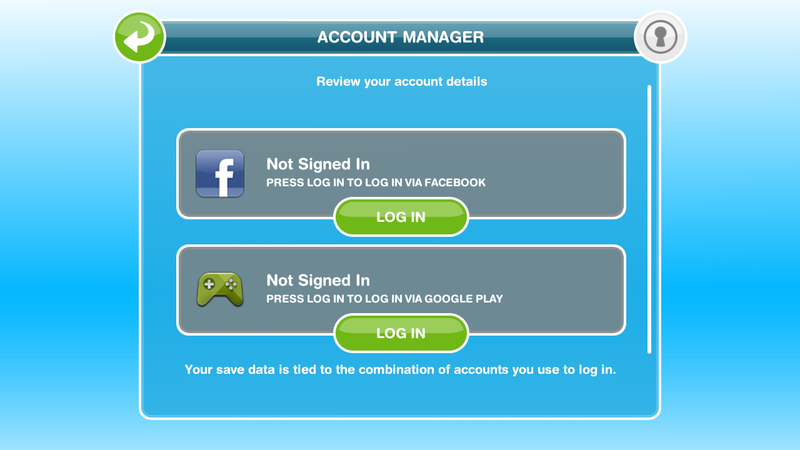 In new version (5.17.0), Android players can now add their Google Account to the Account Manager in FreePlay. It has same function as Facebook Account as well. If you already have friends on your Google Play Games or Google+ once you log your Google Account in to FreePlay, friends who play The Sims FreePlay will be automatically added to neighbor list. Also as an account to save your data to The Cloud. Beware! 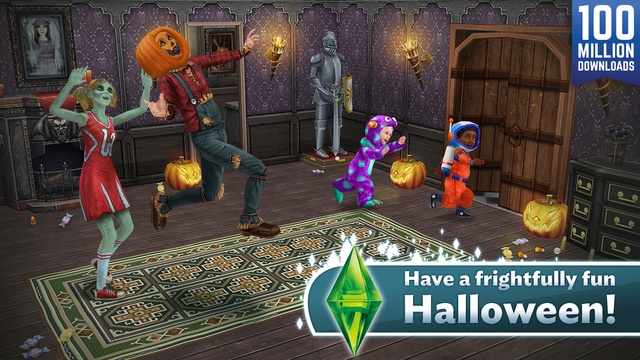 Tiny monsters have taken over Sim Town and your Halloween party is at risk of being a frightful mess. Get scary, get even, and get back the best Halloween in history! Try out some terrifying scare tactics in the Night of the Candy Monsters Quest! 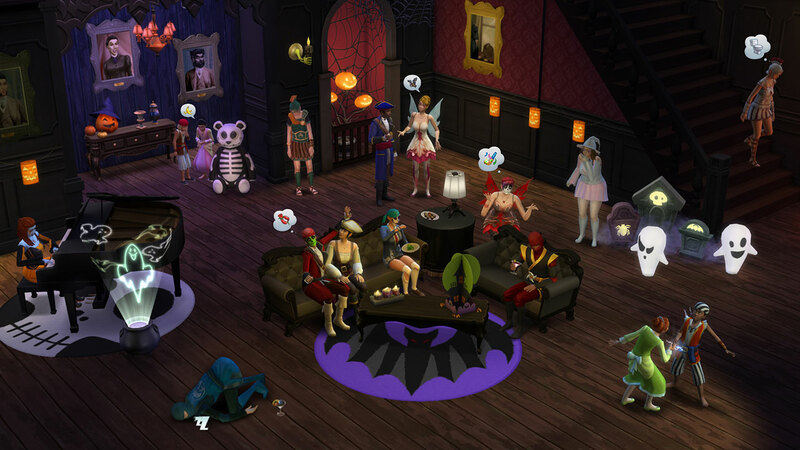 Take over Sim Town on Halloween with outrageously frightening fancy dress, including zombie cheerleaders and vampires! Oh no! The Wizard’s magic is no longer working. 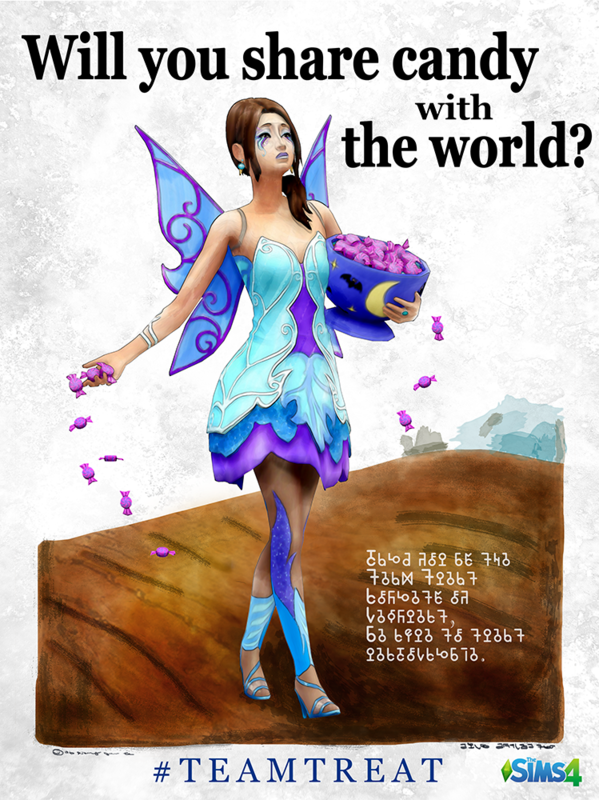 Uncover the magic hidden within Sim Town as part of the Saved By the Spell Quest. Be enchanted at the renovated Wizard’s Cottage! It’s the perfect place to practice spell casting and brew potions. Create unpredictably amazing concoctions as part of the Potion Brewing Hobby. Have a magical family with Wizard Costumes for tiny Toddlers to Adult Sims! The Sorcerous Supplies store is stocked full of magical new items and decorations for your mystical home. 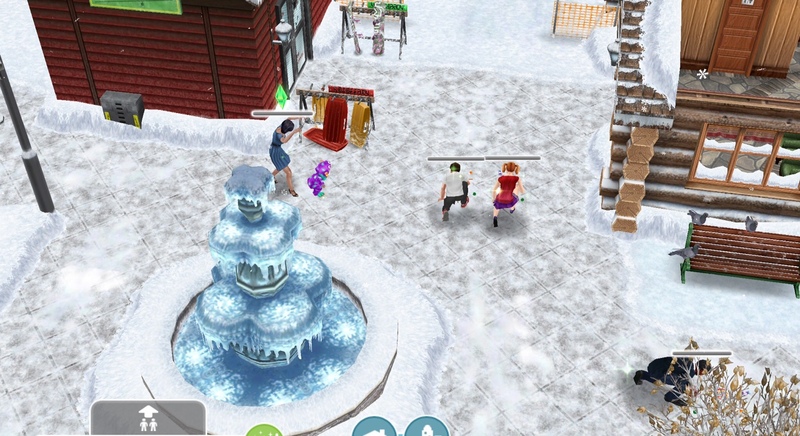 Click here To townload The Sims FreePlay for iOS or go to the App Store on your iDevice. Click here To download The Sims FreePlay for Android or go to the Play Store on your Android device. Click here To download The Sims FreePlay for Windows Phone or go to the Windows Store on your WP Deice. SimGuruLindsay memamerkan bagaimana bentuk "sheep" yang ada di Windenburg. Meskipun ini hanya FX. Tapi, memberikan kesan Traditional-Country ke Windenburg! 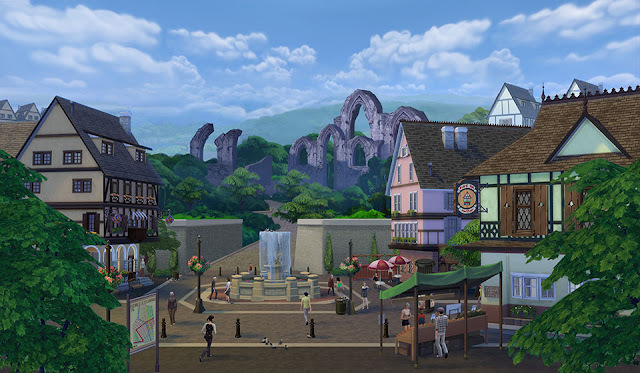 The Sims 4 Get Together Expansion Pack* introduces Windenburg, a European-inspired world complete with ancient ruins, Cafés, and discotheques that look nothing like what you’ve seen in The Sims 4. We knew really early on in the development of the expansion that we wanted to go with something more Euro, but it took a lot of experimentation to get from those early discussions to the version that’ll ship with the game in December. Europe is a huge continent with countless architectural styles and sub-cultures, so we realized we needed to create something unique, but still authentic. 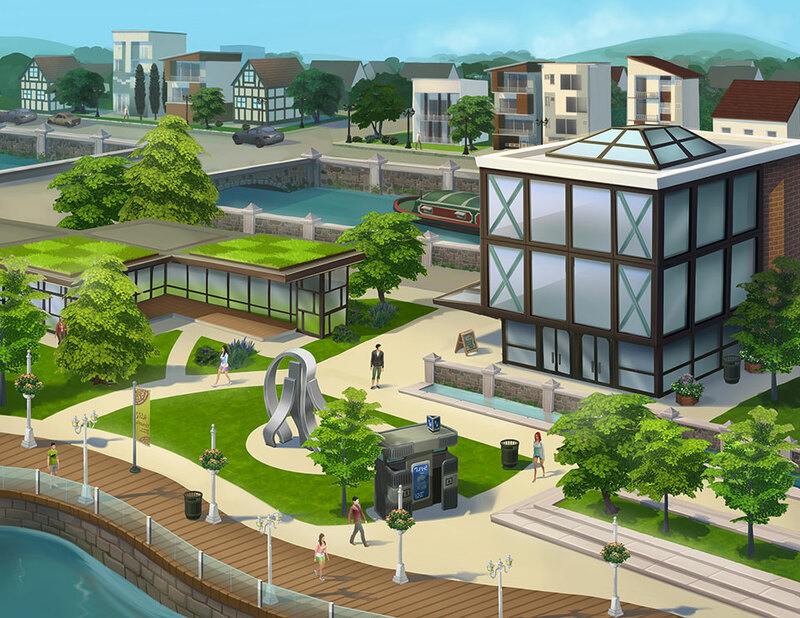 We want Windenburg to feel like it could be found in many different parts of Europe while still feeling like its own, distinct location. 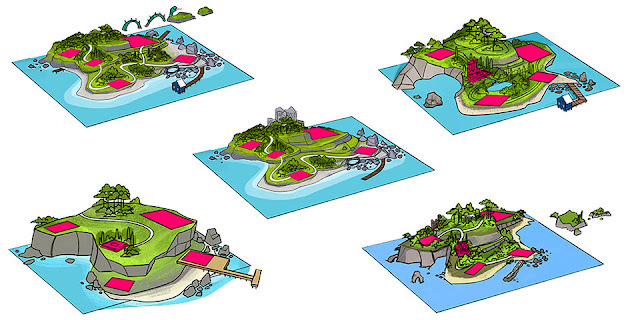 We gathered some concept art that shows how we ended up where we are, from first sketches to fairly complete images. Not everything in the concept art is going to end up in the final game, but we want to show you the whole process. Early on, our concept artists explored a bunch of different ideas to figure out how Windenburg should really look. Maybe it should have an “Old Town” area, or maybe there should be a traditional open countryside. Maybe part of it should be on hills? Maybe it should have all of the above? As we started to flesh out this entirely new place it became very clear that the rules of architecture in classic Europe are very different then the things our Sims worlds have been filled with before. Namely, the variety – since many of the cities we referenced are centuries old, many of the buildings date back hundreds of years. Peppered between old buildings are new ones, creating an incredibly unique aesthetic that we really wanted to embrace. 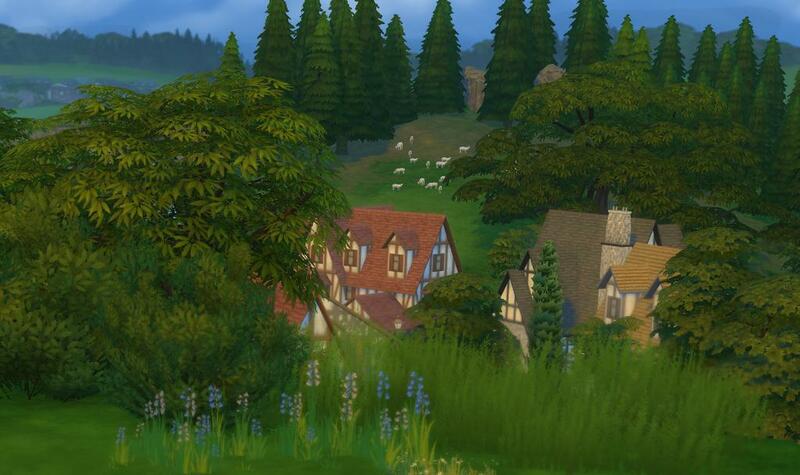 This mixture of old and new feels distinctly European, and we wanted to make sure we captured it in Windenburg. To embrace this mix of styles we needed to bend the classic rules of architecture and find a way to merge those disparate pieces. Our artists began to experiment with different styles of residential architecture, playing with different motifs to see how they could work together. In the end, we went with something that was sort of a Tudor Modern – a mix of contemporary construction and the kind of buildings built during the 16th century in England. Once we’d decided on the aesthetic and how it’d look on a small scale, we had to take a few steps back and think big-picture. Here’s a look at what we wanted the map to look like – and this is actually pretty close to the layout you’ll see in game! There’s a lookout spot on the Pier in the Business District where you can see indications of every distinct neighborhood, from the Countryside with rolling pine-covered hills and electric windmills in the distance, the Old Town with quaint Tudor buildings and repurposed fishing canneries, and the high-end residential Island that sits in the middle of the Windenburg Lake. On one side of the island, sandy flat areas with fishing docks. On the other, a mansion overlooking the sea (and if you’re lucky, you might catch a view of Windenburg’s elusive sea monster). Once we’d finished sketching maps and architecture, we started to create some visual snapshots to really show off the districts. 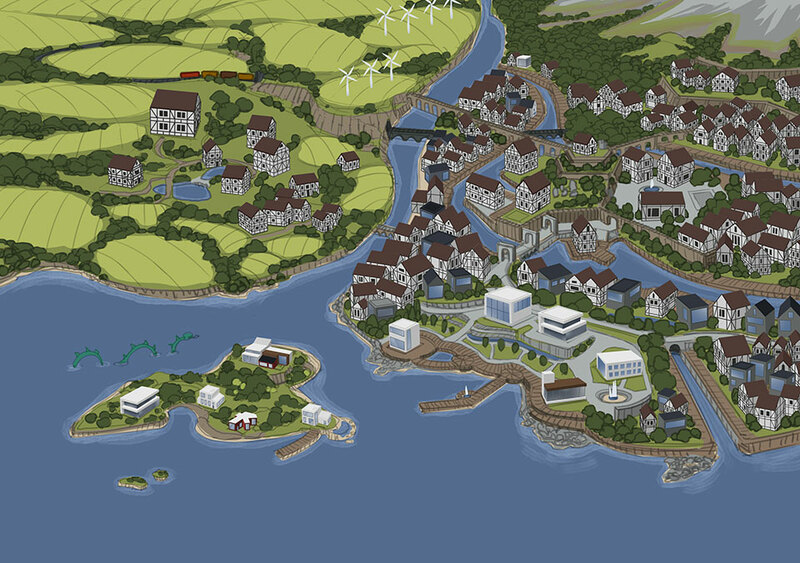 There’s one here (and one in the opening of the blog) that serve both as explorations as to how these places could look with Sims living in them, and also provide a visual target to the team responsible for building them in game. We’re really happy with how closely we were able to recreate these in game and even more excited about the different elements we were able to build out as development went on – even that statue made it! In August, we showed off our next expansion pack, The Sims 4 Get Together*, including the beautiful world of Windenburg, the DJ and Dancing Skills, and the ability to create and join your own unique Clubs. As you might have guessed from the name, this expansion is about your Sims getting together in really exciting new ways. We loved seeing your reactions to the news, and closely followed all of your comments and discussions. Your enthusiasm and feedback inspired us to work even harder to make sure that this pack is everything it could be. So we’ve decided to take a little more time to work on the expansion pack. The Sims 4 Get Together will now be releasing in North America on December 8, and rolling out to the rest of the world by the end of that week. 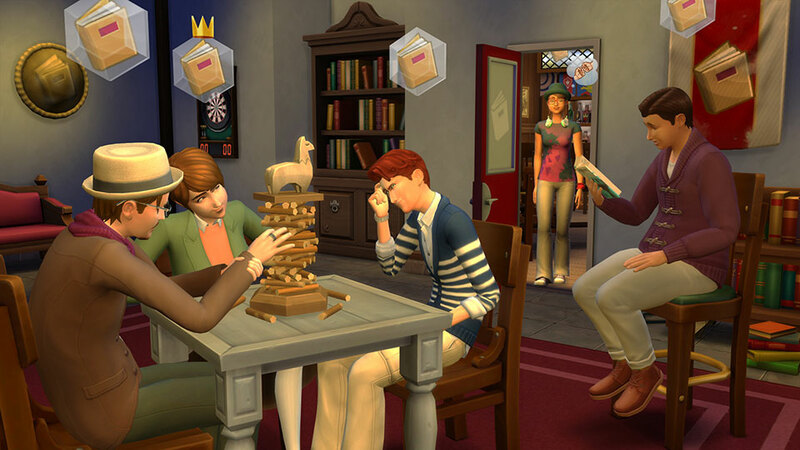 We’re taking this time to add more polish and depth into the core of The Sims 4 Get Together. We think this time will allow us to make the experience even bigger, better, and cooler. We’re working on some new items and features that we really think you’re going to love. There’s a new board game (Don’t Wake the Llama!) and the Natural Pool now has a diving rock for your Sims to jump off! A lot of extra attention is also going towards Clubs, which allow you to create new social experiences. As we played with our Sims hanging out with their Clubs, we felt like they needed a special hangout to call their own – the Upper Crusts should have a private room at the local Café, and the Spin Masters should be able to have an exclusive Discotheque where they practice their dance moves. You can still take your Club members out and about, but now you can also create your Club’s signature spot, and that can lead to cool personalization. We’re really excited to take some extra time on making sure the new expansion pack is filled with things to do, and we look forward to telling you a whole lot more about The Sims 4 Get Together in early November! 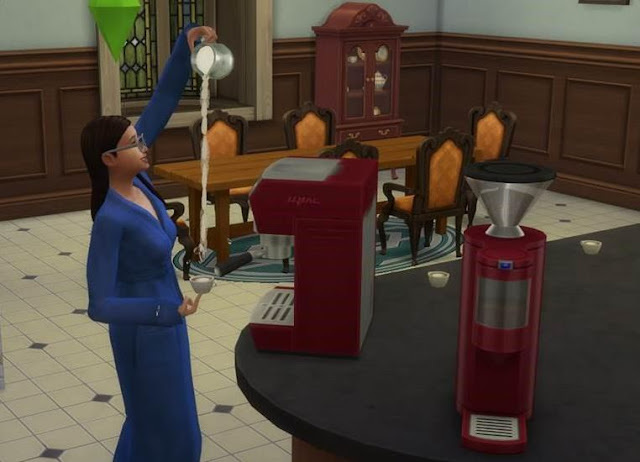 Dalam rangka National Coffee Day di Amerika, Sim Guru Azure memberikan screenshots bagaimana bentuk Espresso Machine yang akan hadir di The Sims 4 Get Together yang akan di release bulan November nanti. The Sims 4 News: Making a SpookyHouse! Lay out the basics of your haunted house. There are some general themes to use that will set you down the right path when creating a foreboding home. Use the “Filter Items…” button in Build Mode to quickly narrow down your search to content that would be appropriate in a spooky setting. I recommend filtering under “Styles” and selecting “Queen Anne”. With your filter applied you can find a number of Victorian inspired “Styled Rooms” for a quick build, or try clicking on “Objects by Function” to see a wide assortment of individual objects that fit the theme. Prepare your home to host a great party. Something I like to do to enhance the party atmosphere is to remove any chairs from my home’s dining room and use that space as a serving area instead. Include a bar that guests can get drinks from – or if you have The Sims 4 Luxury Party Stuff* you can add a drink fountain. Just before guests start to arrive, place a few of the new candy bowls that they can help themselves to. It’ll tide them over while you’re putting the finishing touches on delicious new finger food like Cheesy Eyeballs, Spooky Cookies, or the culinary pièce de résistance – the brand new Zombie Cake. Create a scary living room with style! Your home’s living room is where your guests will likely mingle, and a good host adds everything they need for a spooktacular evening of fun. Try using the “Filter Items…” button in Build Mode again, but this time select “Packs”, and then choose “Spooky Stuff”. Now when you click on the “Objects by Function” button, you’ll see all of the new themed objects that come with The Sims 4 Spooky Stuff, and you’re ready to decorate. A variety of new chairs, tables, décor help create a setting that can only be described as spooky-shabby-chic. Share the spooky spirit with the neighborhood. Using the filter to again search for Spooky Stuff, you’ll find a number of objects perfect for the outdoors. Not only are the ghost lamps adorable, they come with multiple expressions that you may not have known about. Click on their color variant bar and you’ll find each one has a different expression to match the party’s mood. My personal favorite outdoor object is the “Parlor Trix Graveyard Lantern” – a set of tombstones that light up in different colors, as well as emitting fog to really up the ambiance. If you’re going all out though, terrify the community with a gigantic spider crawling on your home… simply select the “Misunderstood Spider” object and before placing it press the “]” key on your keyboard a few times. With a couple of clicks, you’ll have a deadly creature meant to terrify guests as they arrive! Party time! Carve those pumpkins! In addition to the aforementioned food, attendees will all want to partake in carving their very own pumpkins. Place multiple Pumpkin Carving Stations around your living room, and be sure to find a spot to place each completed pumpkin once they’re finished. It’s important to keep each station free so that every Sim gets a turn having fun carving. Sims that are skilled in handiness can even preserve each carved pumpkin, which in turn become perfect decoration pieces when lit with a flickering candle.